There is bound to be an area in your yard which, because of terrain, or other reasons, isn't a prime gardening location. Perhaps your garden may simply lack a "finished look" because of the bare earth showing between your shrubbery. Steep slopes or banks which need vegetation to prevent erosion may support sod, but can be unsafe to mow and maintain. For these areas we look to the group of plants known as ground covers. The suitability of a plant to use as a ground cover is determined by it's growing habits, not necessarily by size or by height. 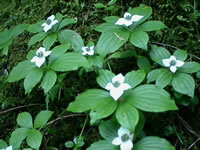 Typically, ground covers sprawl, spread, run, or colonize by reseeding. Some ground covers will only grow in full shade, others thrive in full sun, and still others will survive no matter where you grow them. Some prefer moist soils rich in humus, others are well adapted to dry conditions. The shallow root system of most ground covers makes them suitable for planting between Rhododendrons or other broad leaf evergreens, which resent having their roots disturbed by cultivation. These attributes of the ground cover make them very useful for several purposes, including weed and erosion control. Ground covers come in a wide range of sizes, colors and textures, adding interest, beauty, and uniformity to the garden. Make your plant selections carefully, so that the plants are suited to your climate, plant hardiness, water availability, soil pH, and light exposure. with a good all purpose (10-10-10) fertilizer. Ground covers are planted in the same manner as other perennials or shrubs. Generally, they should be planted in the spring or early summer to allow them time to become established before winter. As in other areas of the garden, you will want to "stage" your ground covers so that the lower growing types are in the foreground, with the taller shrubby varieties as the backdrop. You can plant low growing annuals in the spaces between your permanent ground covers as a temporary "fill in" until the perennials become established. Nasturtiums work quite well for this purpose. The first step in preparing the new area is to rid the soil of all the weeds and debris. Till the soil first, and then mix in organic matter, such as compost, peat moss, or manure, into the top eight inches of the soil. Usually, you will plant your ground covers about a foot apart, but if you need a quick cover up or you are on a tight budget, you can plant them closer together... or farther apart. Water your ground covers regularly for the first year to ensure their survival, and to help them become established. Apply a thick layer of mulch to control weeds, conserve moisture, and moderate the soil temperature. It may require a year or more for your ground cover to become established and begin to spread, depending on the type of plant and the conditions. Once they become established, ground covers will usually maintain themselves with a minimum of watering and care. Some ground covers look neater with an occasional pruning or mowing. Normally, however, the only necessary pruning will be to remove damaged foliage or disproportionate, straggling branches, or just to keep the plant confined to it's allotted area. Certain plants such as Pachysandra or English ivy will look much neater and better if they are literally mowed back to six inches every other year.